Lumphini Park: This was, quite by accident, my first adventure in Bangkok, and I cannot say enough about it this 142-acre homage to Thailand’s flora and fauna (holy gigantic monitor lizards!). A visit to Lumphini Park is the best way to escape the horns, smog, and puttering of a thousand tuk-tuks and take in the city skyline. The contrast of nature and skyscrapers is this traveler’s dream. Lumphini has what you’d expect at any park: outdoor Tai Chi classes, couples practicing ballroom moves, joggers galore, exercise equipment, a playground. But it also has an array of interesting public art (my favorite: a Botero-esque sculpture called “Women in the Next Three Decades”); an amphitheater for music and dance performances, the largest collection of orchids I’ve ever seen; winding rivers and still ponds that can be either a place of quiet and solitude, or a window into the scurry of city life, depending on what you want to see and where you sit. I spent nearly my entire first day in Bangkok wandering the park — it was even more relaxing than our beach days in Vung Tau, Vietnam. Shopping in Silom: There’s no better place to get caught up in the hustle and bustle of Bangkok than this financial district. Cheap shopping? Check. Movie theaters, massages and myriad street food options? You betcha. (Please try the wonton-wrapped, fried quail eggs with sweet and sour sauce, accompanied by a Thai tea with coconut milk. You will not regret it.) 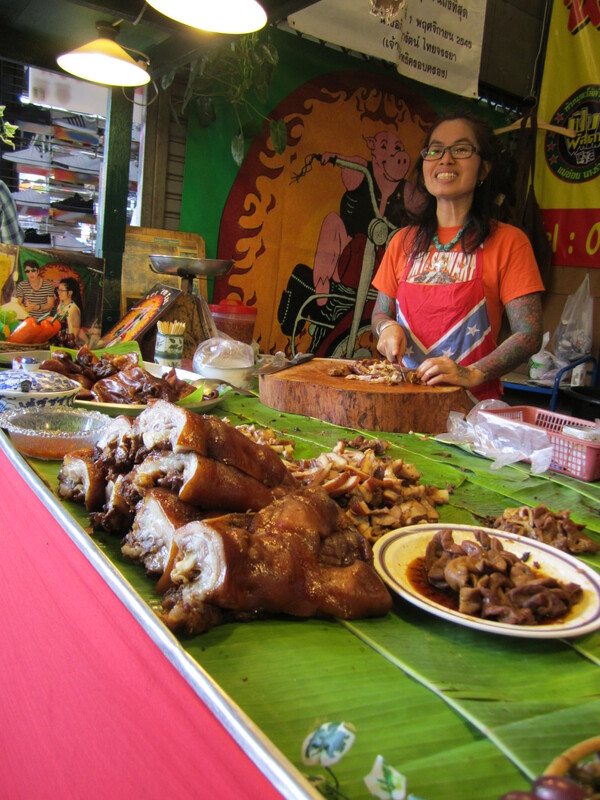 See the Skytrain roar overhead while you munch on unknown animal parts-on-a-stick and duck into mysterious back alleys for the best bargains and the best fruit shakes you’ve ever had. Bangkok Arts & Culture Centre: Putting aside the fact that, when I visited, three out of the four exhibits on view were by “artists” who happened to be related to the King, BACC is worth visiting for the impressive architecture alone. In the heart of Siam Square, this swirling glass and concrete structure is a fun (and free!) way to while away the heat of the day. Count the Kings: Even discounting the disproportionate number of royal relatives represented at BACC, nepotism appears to be alive and well in Thailand. The battle between the Yellow Shirt and Red Shirt rages on, but no matter what color the shirt on your back is, Thais seem to adore the King. We’re talking billboard-sized posters on every building; shrine-like portraits on public walkways; even calendars with a new picture of the King for every month of the year. New for 2011, January featured the King in a cowboy hat! For a Westerner (and, I imagine, any foreigner) this love and devotion is a surprising change of pace from politics as usual. Erawan Shrine: On the corner of a busy street, bounded by the Skytrain and the upscale Erawan Hotel, is the shrine of the four-faced Buddha, who is famous for granting prayers. In return, the faithful hire traditional Thai singers and dancers to honor the Buddha. You don’t need to visit far-off temples or mountaintop stupas to see modern Buddhism in practice: just follow the marigolds. Chinatown: “One night in Bangkok and the world’s your oyster.” This was certainly true for me: the sights, smells and tastes of Chinatown included the largest oysters I’ve ever seen; sweet steamed crab; tea-braised ducks hung in shop windows; savory sticky buns filled with everything imaginable (and some things I don’t want to imagine); piles and piles of fresh fruit; bird’s nest soup (yes, it’s what it sounds like, but worse); and even the storied shark’s fin stew. The City Pillar Shrine: Nearby the sexier and more famous Grand Palace is the less-visited City Pillar Shrine. Ways to show your devotion range from the familiar (lighting incense and making money offerings) to the unusual (tying colorful netting to pillars and paying to draw water to pour on nearby plants). I spent nearly an hour just sitting in the shrine, watching people come and go, pray and make their various offerings. No shoes allowed, but cell phones seem to be a-okay. The Brick Bar: On suggestion from the sometimes-reliable Lonely Planet, Alex and I sought out this watering hole off the hippie-strewn path of Khao San Road. It was worth the $10 cover fee: the Friday night ska band was fantastic, the bartenders were quick and unobtrusive, it was dark and worn-in, and before we left people were dancing on the tables. 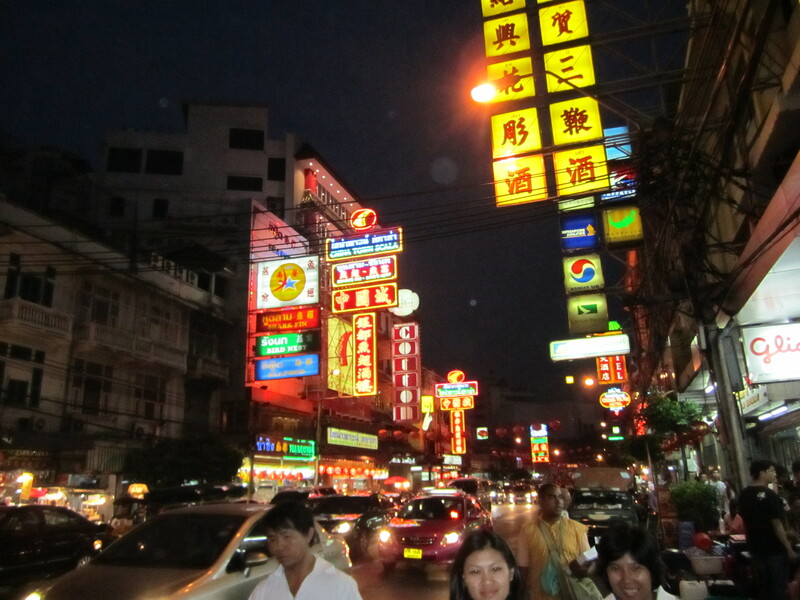 Soi Cowboy: All I can say is that, despite many whispered promises from strangers on Khao San Road, we never found a ping-pong show. Chutachak Weekend Market: I thought I had seen markets here in Korea, but this is a shopping extravaganza unrivaled by anything in my Asia experience. Where else can you find everything from handmade shorts to slap bracelet wristwatches to freshly sliced and diced pork sandwiches to handthrown pottery to indie silkscreen tees to antiques to lotions, potions and remedies…the list goes on and on. Alex and I spent nearly four hours in this mind-blowing maze of alley-side shops and stalls shopping nonstop — and I do mean a new purchase approximately every 10 minutes — and spent under US $75 between the two of us. Muay Thai Boxing: What would a trip to Bangkok be without a round (or nine) in Ratchadamnoen’s ring? It might’ve been nearly deserted on the night we went, but it didn’t make the fights any less exciting — especially the main event, where the only Westerner on the card was knocked out by his tiny Thai opponent in the first round. My only complaint is the ticket price: at $30, this was by far the most we spent on entertainment in Thailand. Grab some snacks, arrive early and see all nine fights to get your money’s worth. Oh, and don’t buy tickets from anyone but the ticket booth, or you might be out $30 and still not see the fight. Check out the video from our trip to the ring! Seriously. The names of these places sound like something out of a Dr. Seuss book. The names are strange but the alphabet is stranger. It looks like moon language. I’m glad we chose to live in Korea; I’d be hopeless at reading or speaking Thai. You and Baby Bardi are in our thoughts! I hope everything is going fantastically for y’all.